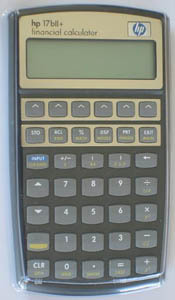 This model replaces the HP17BII. For professionals in real estate, finance and business. Complex business transactions demand a calculator that's both powerful and easy to use. 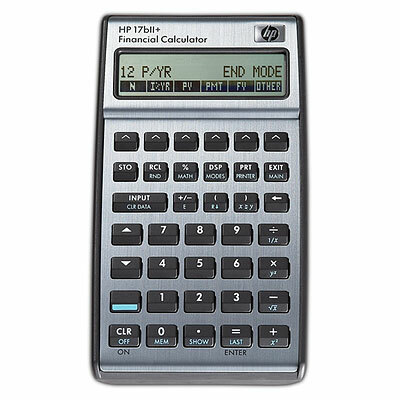 The HP17bII+ financial calculator adds a new feature to an impressive sum of productivity tools: 28K of user memory for cash flows, calculations and messages. Factor in RPN and algebraic data-entry modes, the time-saving HP solve application, a long battery life — and the results equals one strong financial asset to your business. The 28K user memory allows you to calculate cash flows, sum, equations, and solver variables — and include messages, too. Choose between Reverse Polish Notation (RPN) and algebraic data-entry modes. RPN is an efficient data-entry mode that expresses a sequence of calculations without using parentheses, which reduces the number of keystrokes. Review your calculations through data stored in a list format. Scroll through and edit as the information changes--the built-in clock keeps you on time. Write and solve equations for any variable without rewriting your original equation. Hewlett Packard specializes in high-quality products and first-class support. Limited warranty and technical support are available.